Getting stylish outdoor seating is simple when you choose our chrome bistro chair. Its aluminium frame is both contemporary and weather resistant - perfect for when you want to provide outdoor robust chairs that also have a very chic appearance. Today, the choice of seating available is huge and we make sure we offer a really wide range of items so there’s a product for all your occasions and venues. In the 21st Century it’s possible to choose seats made of all kinds of materials, with different plastics, metals and natural materials finished in an enormous variety of colours and styles - you can even opt for a chair made from crystals! Selecting seating many years ago was a very different story though, and prior to the 17th Century wood was the most common type of substance used to manufacture chairs. It was in the 20th Century that this really began to change. Coupled with an increase in the types of material being used - such as polypropylene and more metals - and innovative ways to manufacture products, lots of new chair types hit the market. As well as proving very practical, hardy and affordable, many seats were designed to make an impact visually. This accurately describes our chrome bistro chair, which is so robust you can use it outside. The hardy nature of this seat harks back to one of the first types of chairs made from aluminium. Called the Navy Chair, the destiny of this chair is hinted in its name! During the 1940s, the Electric Machine and Equipment Company (Emeco) was commissioned by the US Navy to create a seat that would be used on WWII warships. The military were keen to install ships with very hardy chairs that would not be easily damaged when the fleet went into battle. It’s been reported that after this product was made it was thrown six floors from a building to see how robust it was - and it passed this test as it was only lightly scratched from the experience. This is down to the aluminium frame, which is the same type of material used in our chrome bistro chairs. It’s easy to see why this product range is so weatherproof and robust. Because of this finish, our customers are free to utilise the outdoor parts of their premises, and install seating that can withstand rain and remains rust-free. The British weather is of course known for the occasional rainy spell (especially in Summer!) but when you order our bistro chairs, simply leave them outside and wipe dry following a shower and they’re ready for use once again. 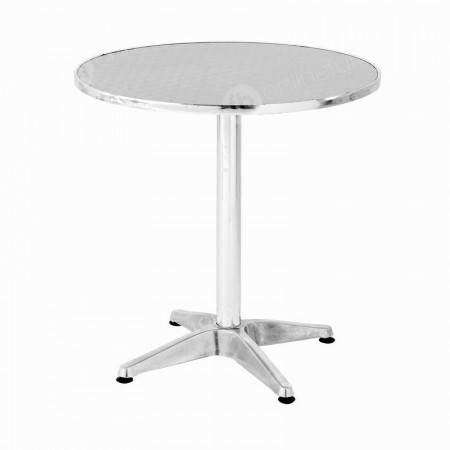 We also have chrome bistro tables that perfectly match this seating and are also weather resistant. When you need higher tables and seating that has all the great benefits of these items, then why not take a look at our chrome poseur table and stools too. The similar materials used are the one thing thing our bistro chair and the Navy Chair have in common. As they are made from this very hardy metal, they withstand knocks, but they are also very lightweight. This is a fantastic benefit for our clients who may want to use this type of seating now-and-again, such as during the hotter months, or for occasional outdoor and indoor events. The frame is very easy to lift, and when you want to store them simply stack up. Where these two chairs differ is there design. As might be expected from a chair made in the 1940s, the Navy Chair has a very traditional shape. Whereas our bistro chair has all the curves and sleek lines you’d expect from a seat designed in the 21st Century. This makes it an incredibly modern option for our customers. In addition to choosing outdoor seating that can withstand rainy weather, seats being used outside of your premises ought to be super smart too. This is because, outdoor chairs might be the first thing potential customers see when they are visiting your premises. Having stylish furniture could help to increase footfall, as it attracts clients to your cafe or restaurant. Will these chairs stand up to the British weather? Yes! 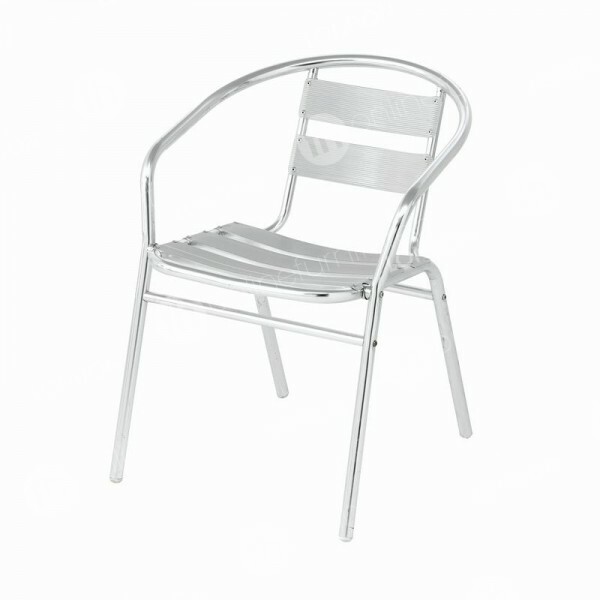 Our bistro chairs have a weather resistant aluminium finish, which keeps them rust-free. When it rains there’s no need to rush them indoors, just wait for the inclement weather to pass and simply wipe dry with a cloth. I only want to use them occasionally - are they easy to store? Very. Thanks to the material used, these seats are very lightweight, so they don’t require much effort to stack them up for storage. I’d like outdoor seating for my cafe - do you recommend these? Without a doubt. They are a very stylish addition to lots of different premises, including cafes, bars and restaurants - and they’re also really easy to keep clean. Would these suit indoor functions as well? Yes. Many of our customers choose them for indoor events. The contemporary design ensures they bring some glamour to your occasions, and they also make modern and informal break areas in workplaces. Do you offer long furniture hire periods as I’d like to have them on a near-permanent basis? You can hire chairs from us for as long or as little as you like! Because these are suitable for long-term outdoor use then our customers like to rent these for months, even years. Our rates are very affordable, especially when you require long term furniture rental.